"Ritchie Blackmore was all in black, doing these incredible classical runs. I immediately became a fan." "The first Heaven & Earth album was really a solo effort with everybody I knew playing on it," says guitarist Stuart Smith. "The second record was more of a studio project, but on this album we're a band. It's what I've always envisioned, really, and I couldn't be more delighted." Smith, a guitar stylist who comes from the Ritchie Blackmore school of baroque meets hard rock (not surprising, as the former Deep Purple ruled took Smith under his wing), has paid his dues, playing clubs in his hometown of York, England, before relocating to the US 30 years ago. A succession of bands (including Aliens of Extraordinary Ability, which featured Keith Emerson) followed, but Smith routinely found his musical instincts at odds with those of record execs who were looking to sign easy-hit pop stars. "It can always be frustrating it you don't fit into the latest batch of whatever's selling," says Smith. "I stuck to my guns, though, and although it's taken more time than I imagined it would, having Heaven & Earth in 2013 is immensely gratifying." The self-titled Heaven & Earth debut (1999) and its follow-up, 2004's Windows To The World, won Smith raves in the guitar community - in 2004, he snagged the "Best Guitarist" award at the Los Angeles All Access Music Awards Show. 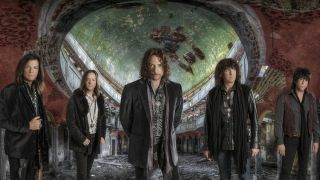 But with the forthcoming Dig (out 23 April on Quarto Valley Records), the guitarist and his new bandmates (singer Joe Retta, bassist Chuck Wright, drummer Richie Onori and keyboardist Arlan Schierbaum) are looking to win the hearts of more than just shred heads. "Being the guitarist, I happen to think there's some good playing on the record," Smith says. "But this is an album for people who long for great hard rock songs that are bursting with melody. And we're out to prove it live, too. What you hear on the album, we can pull it off on stage." Smith sat down with MusicRadar to talk about the new album, why recording to tape beats digital and two of his famous rock star friends who share the same first name (but spell it differently). So you were mentored by Ritchie Blackmore. Not everybody can say that. How did that happen? "I was classically trained originally, with no interest in rock music at all. But I went with some friends to a concert when I was 14. I sat through the whole thing, totally bored, but the last act on the bill was Deep Purple. I was mesmerized. Ritchie Blackmore was all in black, doing these incredible classical runs. I immediately became a fan. "Years later, Ritchie and I met at a party and became friends. We were both into the same things - classical music, soccer, psychic research - so it was easy. When I moved to Long Island, at his suggestion, we used to go out chasing women and drinking [laughs], and we went on a vacation together. We had a lot in common. Of course, whatever he said, I took as gold. "More than anything, he gave me his philosophy about the guitar, how he approached it. I remember watching him play the guitar at breakfast. He was walking around the kitchen dashing off this amazing run. I looked at him and said, 'How do you do that?' He kind of winked at me and said, 'Practice.'" "One of the best things he told me was how he approached solos. He'd listen to a song and figure out its meaning; he'd listen to the lyrics and try to put himself in the right frame of mind, like a method actor, really. From there, he'd channel the emotion and let it come through on the guitar. He was very fast, but he'd try to let the spaces between the notes shine through. He would build a solo, and whenever he put in a flourish, it was for emotional depth, not flash technique. That really rubbed off on me." Can you point to a couple of solos on the new record where you put that into practice? "Definitely. On the song I Don't Know What Love Is, I was feeling exactly what Ritchie told me. I was in the moment, and it came out in my playing. On all of the songs, I was deep in the lyrics and the melodies - it was all very real - so Ritchie's advice was in my head the whole time, even if it was just subconsciously." What are your main guitars? Did you have a few go-to models that you used for the album? "My main workhorse is my number one Strat; I'm always using 1970s Strats. I have them worked on a bit. I also doubled a lot of the rhythms with a Les Paul. You get a nice beefy sound with Les Pauls, especially when you're cutting to tape. There was a Telecaster, too, which I've never used before. For acoustics, I played a Breedlove and a Babicz. I also used a Taylor 12-string." You mentioned tape. Now, I understand that you utilized CLASP in the studio, which allows musicians the ability to cut to tape while still employing Pro Tools. "That's right. Our producer, Dave Jenkins, heard about CLASP, and he said that it would give us the warmth of tape along with the luxury of using Pro Tools. So you can drop in on the fly, the whole band. We were going to try it out for just a couple of days to see how we liked it, and it was tremendous. You tend to forget how warm tape sounds compared to digital. "We used it in the studio for the basics, and then when we went to our own studio for overdubs, we bought a four-track Studer and ran the CLASP through that. The results speak for themselves. CLASP helps you get the classic sound of bands in the '70s, which is something that I guess we try to emulate." "I love him to death," Smith says of former brother-in-law Richie Sambora (left). "He's the nicest guy." Richie Sambora plays on the song Man & Machine. How do you know Richie? "Richie was so excited - 'Oh, my God! Nobody ever asks me to sing. They only want me to play guitar.' And as you know, he's got a lovely voice. We did a version of Deep Purple's When A Blind Man Cries. Richie sang on it, and he was absolutely superb. The fans loved it. Having Richie on it brought a lot to the table, and he did play guitar, as well, on that and another one of the tracks. "So we've been good friends and have stayed in touch even though we're both divorced from our wives now. Richie was down at EastWest Studios in Los Angeles, working on his solo album. What happened was, I needed an SG. My producer said, 'We should have an SG on this song,' but I didn't have one. So I called Richie, knowing that he'd have one, and he said, 'Yeah, I've got an SG. Come on over, and you can borrow it.' So I went to the studio, and we hung out. While I was there, we both signed a Strat that was to be auctioned off. It ended up on the internet, and fans kept saying, 'Oh, my God! Are you two going to collaborate?' The reaction was incredible. "I called him up and asked him if he wanted to do a track on the new album, and he said that he'd love to. We were going to do it at EastWest, but there was a glitch with the studio, and then Richie got busy. He was out promoting his solo record, and then he was doing dates with Bon Jovi. On his one day off, he came in and spent six hours working on the track. So I love him to death. He's the nicest guy. If it were me, I would've said, 'It's my one day off, I just can't.' Very gracious of him." There's definitely a '70s British sound to the band - a bit of Deep Purple, a little Zeppelin, a touch of Bad Company even. "This might sound grandiose, but I really hope that we can bring rock to the forefront once again. We spent a lot of time to not just write great songs but phenomenal songs. The previous Heaven & Earth albums were good, but this one is top-notch all the way. There's no excuses. We used really good studios and really crafted it. A lot of bands cut corners nowadays. "We have a classic '70s sound but with a fresh feel. We're out to show people that our kind of music isn't dead. I don't think it is. I imagine that right now labels are running around trying to sign anything that sounds like Mumford & Sons, which will kill their genre - it always does. But we're not trying to sound like whatever is in fashion. We have a sound that has been around, that's known to a lot of people, but it's updated for today."